“I am dark, but lovely,” proclaims the Shulamite in the Song of Songs. The highest and purest form of the feminine archetype is Sophia, the white dove symbolizing the wisdom of the feminine side of God and the deepest wisdom of the soul. 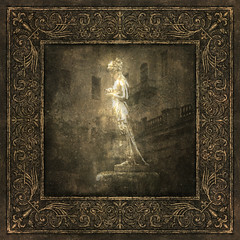 But deep within the world of matter and flesh beats the heart of the dark goddess, whose wisdom is of no lesser mettle. What can we learn from her? Both Madonnas are subject of legends and enormous reverence. The Black Madonna chapel is located where previously was the hermitage of St Meinrad, who started the cult of Mary in Einsiedeln (the word Einsiedeln itself means ‘hermitage’). He was said to have rescued two black ravens threatened by a pair of hawks. The two ravens are now the emblem of the monastery. It is an unusual legend because the forces of darkness and dark primeval prophetic wisdom (the ravens) are threatened by the forces of light and consciousness (the hawks). 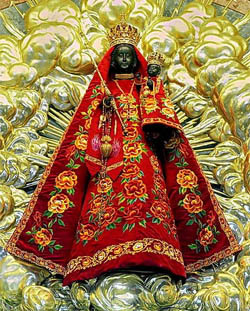 Carl Jung believed that the Black Madonna of Einsiedeln to be a manifestation of the Egyptian goddess Isis, whose cult had spread in Europe before the advent of Christianity. The monastery of Einsiedeln is located in the Dark Forest, an area believed to be a centre of powerful magnetic energy of the earth. This is only what I heard, I do not pretend to know anything about that subject. But if there were a grain of truth in it, the healing properties of the wonderful Madonna would be strongly connected with her place of residence and with the earth itself. All I can vouch for is that she indeed radiates an extraordinary aura of wonder and mystery. Also the cult of Polish Madonna has a lot of ecstatic and trance elements to it. Having been raised in a Catholic country and family, I still remember a lot of religious hymns. I particularly remember these lines from the hymn to the Black Madonna: “Oh Madonna, Black Madonna, it is good to be your child, it is good to hide in your arms.” Black Madonnas appear to be earthly, maternal, wise and possessing magical and healing qualities. China Galland, author of Longing for Darkness: Tara and the Black Madonna, wrote this about the Madonna of Einsiedeln: “this is the darkness of … the womb, of the earth, of the unknown, of sorrow, of the imagination, the darkness of death, of the human heart, of the unconscious, of the darkness beyond light, of matter, of the descent, of the body, of the shadow of the Most High.” Erich Neumann, a student of Jung and an authority on all things related to the sacred feminine, is an author of a book of essays “The Fear of the Feminine,” where he writes very eloquently about the earth archetype, which the Einsiedeln Madonna seems to channel very strongly. 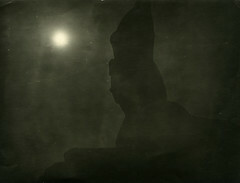 I find Neumann’s work extremely illuminating and very complex. Throughout the ages and up to this day the woman has been accused of enslaving the male, seducing him, bounding him to vile earthly things and endangering the stability of his conscious, methodical, well-organized and purposeful existence. Freud spoke of men splitting the image of the female into the holy one – the mother, the wife, the lawful partner, and the dirty, earthy one – the seductive lover, the evil witch or the prostitute. Jung made us acutely aware that the dark feminine is also a part of the male psyche and is met by him through projection. A fascinating archetype of the dark feminine, who seems to personify all the negatively charged and rejected parts of the feminine psyche, is Lilith, Adam’s first sexual partner, created from dark earth, she refused to be subservient to him. She was banished from Eden and subsequently Eva took her place as a lawful wife of Adam. 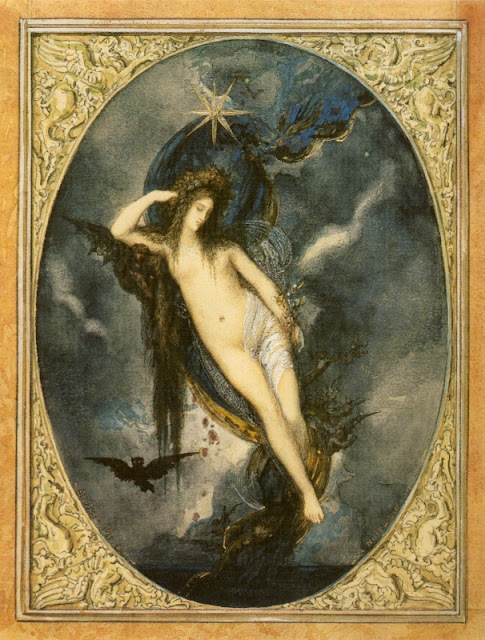 Lilith has had her renaissance in the last decades among feminists, Jungian psychologists, astrologers and other New Age thinkers. The stone which the builders rejected has become the cornerstone of the emerging sacred feminine. For women today who have been victimized and rendered passive and obedient, there is gold lying hidden in this shadow character: She can represent a woman’s capacity to say no, her desire for equality and independence, and her natural, wild instincts, which may return while healing. If you cannot express love because you feel too vulnerable, if you are afraid to care, lest you become dependent, look for Lilith. In the most primal depths of the psyche, Eve and Lilith carry the two halves of feminine wholeness. 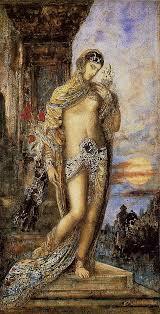 For several millennia, Eve dominated Western culture. Lilith has scarcely been permitted to exist. We are fascinated by independent women: the media, literature and popular music testify to that. Do you know the amazing song Venus in Furs by the Velvet Underground? For me she is present in that song. But she is often like a wonderful beast admired from afar because hardly anybody is brave enough to approach her. 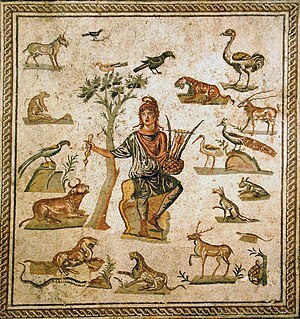 There are male characters in art and myth, who were able to tame her wild nature. One was Aragorn and his horse Brego. Neumann wrote beautifully about the aspect of the goddess associated with wild nature – he called her the Lady of the Beasts. The Great Goddess evinces her rule over the bull and the lions. And for millenniums she stands or sits enthroned upon lions, as the Mesopotamian goddess Lilith of night, evil, and death, winged, bird-footed, and accompanied by owls. 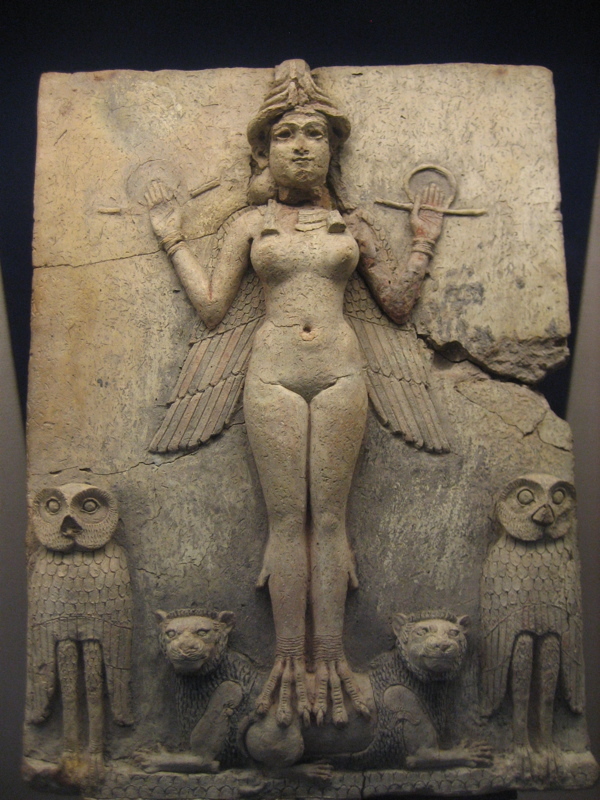 Neumann seems to merge Ishtar and Lilith, which is a very interesting supposition. 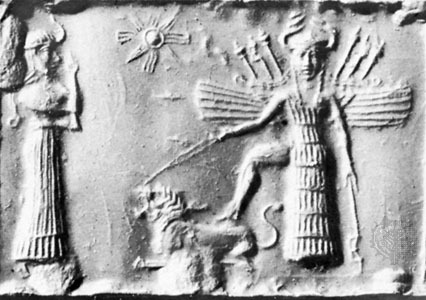 Ishtar or Inanna, the chief female deity of Babylon/Mesopotamia, had lions as her chief attributes. In a well-known myth she undergoes an initiation by descending to the realm of her sister Ereshkigal, lady of the underworld. She dies and is reborn as the one who has successfully tamed and integrated her own dark aspect – Lilith (it is important to remember, though that Lilith can never be completely tamed). After her came gray wolves, fawning on her, and grim-eyed lions, ad bears, and fleet leopards, ravenous for deer; and she was glad in heart to see them, and put desire in their breasts, so that they all mated, two together, about the shadowy vales. And how close ecstasy is to madness, enthusiasm to death, creativeness to psychosis, is shown by mythology, by the history of religions, and by the lives of innumerable great men for whom the gift from the depths has spelled doom. 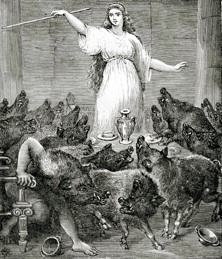 One of the chief characteristics of the Lady of the Beasts, or of the goddess in her darker aspect, is her capacity for wrath and outrage. There are numerous stories in myth on goddesses exacting their revenge if some kind of natural law has been broken. One of them is the story of the Ethiopian sphinx that Hera sends against the people of Thebes. 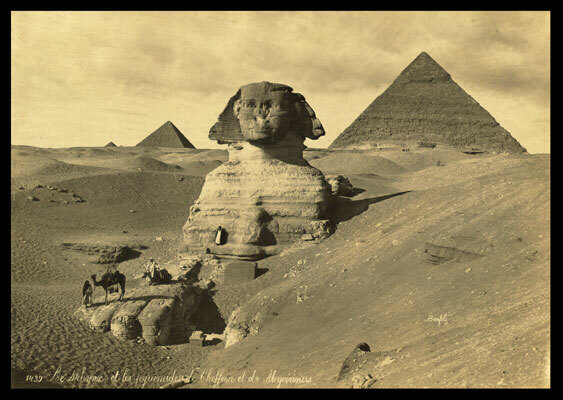 This is the dark aspect of the Sphinx, not the sublimated Egyptian one. The Sphinx from Oedipus myth is merciless and devours human flesh. She is out of control, cannot be transformed and has to be destroyed. 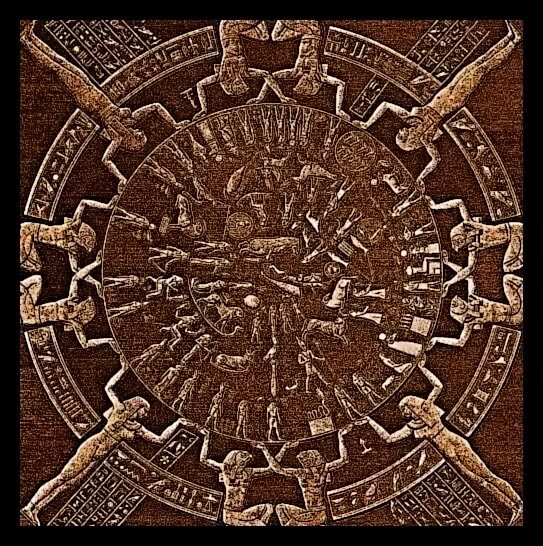 In a famous Sekhmet myth, humans conspire to overthrow the gods and take over their power. 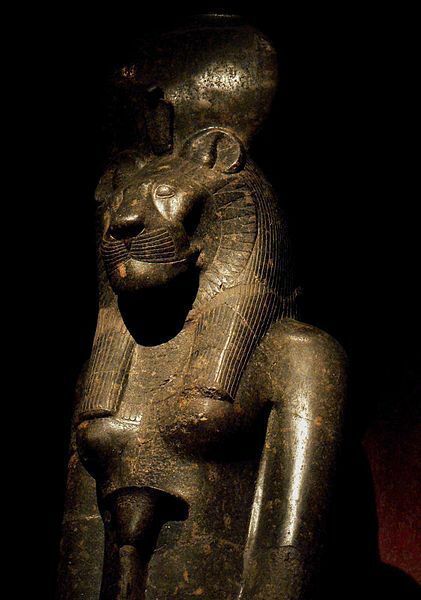 The god Ra sends Sekhmet to punish the evil plotters. Sekhmet, similarly to the Indian goddess Kali, goes on a slaughtering rampage, feasting on human flesh. She gets intoxicated on her rage and blood and cannot be restrained. Gods have to prepare a magical mind-altering potion to calm her down. 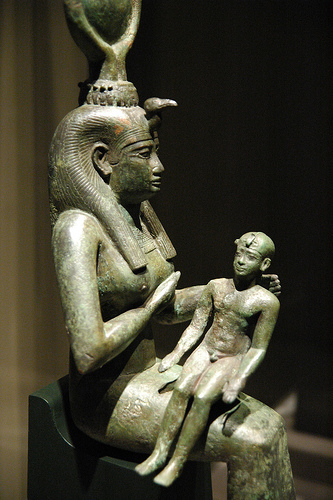 In the end, Sekhmet is welcome back by Ra, who addresses her as the One Who Comes in Peace. Clearly, the myth seems to show that at times peace can only be achieved through a period of destruction and righteous anger that can redress all the wrongdoing. 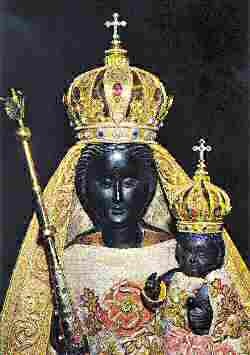 The Polish Black Madonna has got two scars on her face. She, like Lilith, is a wounded female. 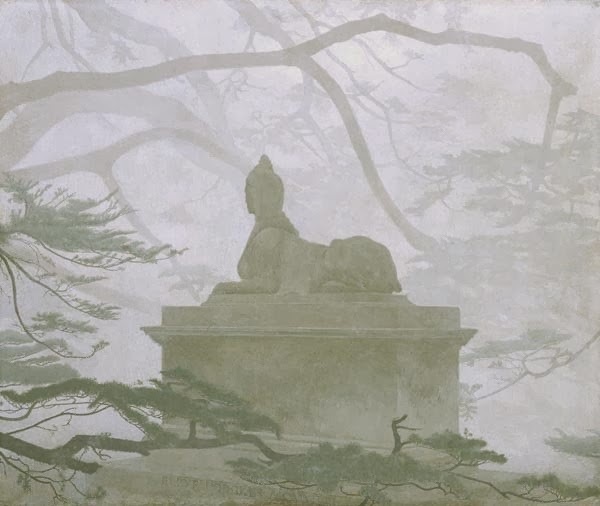 A legend says a soldier slashed the painting when the monastery was besieged. When I look at her I see noble suffering and wisdom resulting from forgiveness and acceptance. Her blackness and vibrance are balanced by love and wisdom. She looks like the dark goddess who has found her peace. 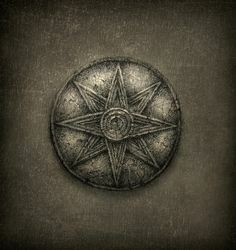 This entry was posted in The Dark Goddess and tagged Dark goddess, earth archetype, Erich Neumann, Hekate, Inanna, Ishtar, Kali, Lamashtu, Lamia, Lilith, Medea, Medusa, Oedipus, sacred feminine, Sekhmet, sphinx, the Great Mother, the Terrible Mother. Bookmark the permalink. Wonderful post! Another dark goddess: the fierce Hindu goddess Durga also rides on a ferocious lion. And the Black Tara (Taras are thought to originally manifestations of Durga), the bodhisattva of power. Yes, I am aware of Durga, she is fascinating. Thank you for reminding me of her. fascinating! I am hoping to learn more about Lilith after your wonderful article. I have Lilith conjunct Mars on 6th house cusp and don’t use Lilith in charts. But now I am reconsidering. Please recommend some resources Monika. Linda, I wish I could recommend something on her. I am really fascinated by this archetype and she is of course very important in my chart – in the seventh house and squaring my Sun in Gemini and Neptune in Sagittarius. Recently I have had Chiron transiting her and it is going to happen again. No wonder I felt compelled to find some answers. I have read an awesome article on the net: http://www.mountainastrologer.com/standards/editor%27s%20choice/articles/lilith_hunter/lilith.html I do not know of any book that I could recommend, though. Hasn’t Demetra George written about her? I have just accidentally found it on fb! thanks! I have Asteroid Goddesses and there is a page on Lilith, What I discovered is that in George’s book my Lilith is in Pisces but on astro.com it is in Cancer, so now I wonder where it really is? such a mecury retro type dilemna? Hope you learn what you need in light of upcoming transit. This is all because there are three bodies called Lilith, the first article that I linked explains it. I think Demetra George uses the asteroid (1181) while astro.com include Black Moon Lilith by default, which is not the same as the asteroid. It is all very confusing. For now I am sticking to Black Moon Lilith. This is the one that is conjunct your Mars. Hi Monika and Linda, I just noticed your discussion- the default setting on astro.com gives the “mean” location of Lilith, to find the “true” position you need to put in h13 on the asteroid list and it shows up on astro.com as “OSC Lilith” for oscillating. It seems you need to intuit which one works for you, similar to how some use the true node and some the mean node. The cosmic intelligence agency article you cited above gives a good explanation. Just like her (the authoer of cosmic intelligence), i notice that people who are aware of the “true” location seem to use it, such as in Evolutionary Astrology. the true location can fluctuate a lot so is more difficult to track day to day without looking it up, but is true, whereas the mean being an average has a more consistent movement- but just know if you go to the Lilith default on astro.com you are only seeing the “mean” location. i think it can also work in some ways to use both. 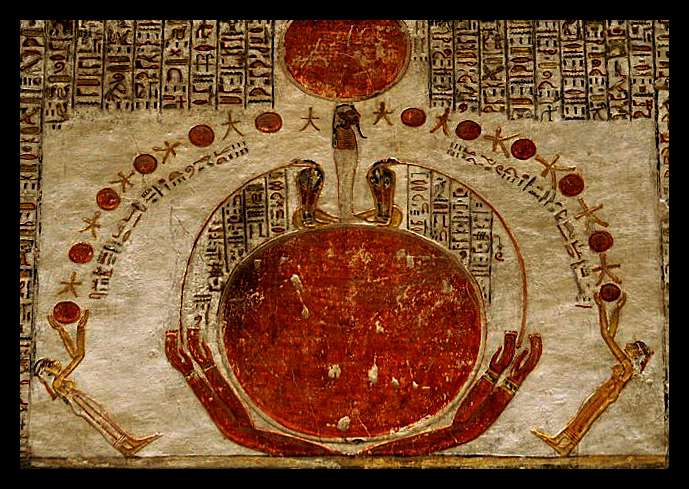 Demetra George uses the asteroid as well as Black Moon Lilith, but she has different meanings for each. Also I was noticing your references about INFJ- do you have any good resources on the Internet you are aware of about this? From my understanding of the system I would guess I am maybe INFP, but also maybe I could be the INFJ, I’m not sure if I understand the difference. I’ll see people talking about them but haven’t ever taken one of the tests and am never quite sure the full meaning people reference since I’m not sure if I totally understand the system. Thank you very much, Gray, for this clarification. The true Lilith makes a lot of sense to me – I have her exactly on my Dsc. About Infj-s, I first took the test when I was at university studying psychology. I have read Psychological Types by Jung and a lot of this knowledge appeals to me. One difference between INFJ and INFP is that the latter are more detail oriented. Even looking at your blog posts one can see how you love little details. I am often stunned by your vast knowledge. 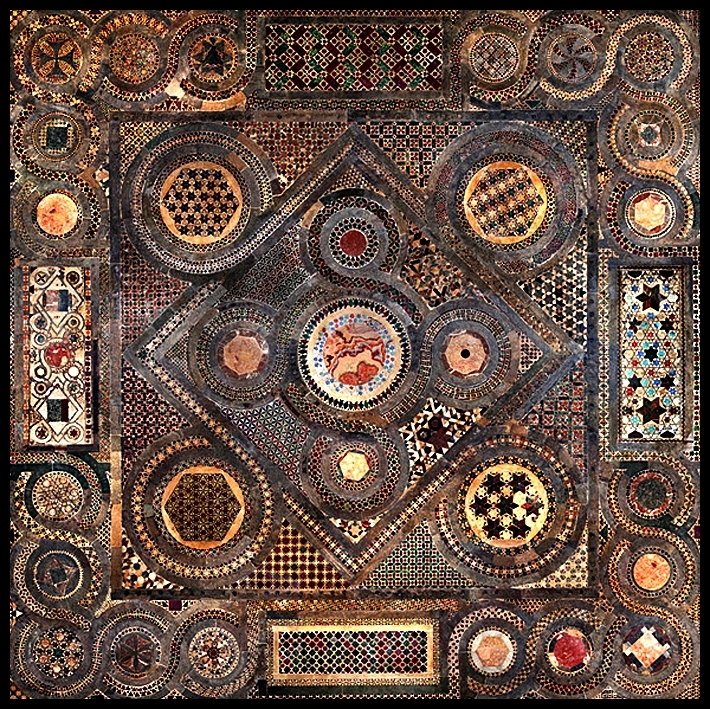 I tend to stop researching at some point as I am more into esthetic pleasure, art, beauty. What these two types definitely share is the need to understand their areas of interest very, very deeply. Thank you Gray for your commentary here. I will check it out the true position to see if it’s a better fit for me. I am not an expert on Myers Briggs but I know that there often is fluctuation between certain attributes such as feeling/ thinking, judging/perceiving, I just reblogged a great article about infj: check it out: http://lindalitebeing.wordpress.com/2013/07/02/an-interesting-detailed-description-of-the-infj/ This article will lead you to other resources and I believe a test. Monika, as usual I am inspired by your writing as well as reflective about recent personal experiences, finding an enlightening context to place them in. In particular I admire the depth of your writing in this piece, and you linking the fear we have of going into our own darkness and emotions to the fear of the Dark Goddess. 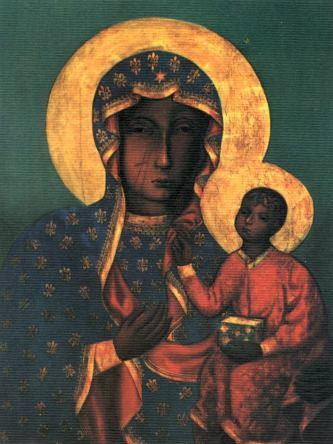 I did not know of the existence of the Black Madonna until about ten years ago, and ended up teaching an English class at one point using “The Secret Life of Bees” which has the concept in it- it’s wonderful to hear your Polish perspective on her. I feel like I have been coming into contact with my Lilith recently. It is true men have this inside them too, including the anger, which is very strange and i don’t think i can explain it, as being a male i also can of course be often in the role of embodying the patriarchy. Yet something about Lilith as an archetype makes me understand my anger in a more enlightening manner than anything else- I went through a long period of being angry at men in general, and of course also at myself for acting like one- something I’ve had to work through and come around to a much more healthy appreciation of my masculinity and men in general. Also, if you admiring Chagall isn’t enough, don’t tell me you are also a fan of The Velvet Underground? I’m a little burned out on them now, but they probably still have to stand as just about my favorite band, though I listened to them so much when I was younger I don’t listen to them much now. Great reference to the energy of “Venus in Furs,” and the brilliant sounds of John Cale combining with the Pisces-ness of Lou Reed! Thank you, Gray. I felt a need to go to Einsiedeln today to see the Black Madonna again. I noticed today that her chapel is made of black marble (outstanding) and the shape of the nave she is in is octagonal! I have been thinking about Lilith so much recently, meeting her in various places and circumstances. This energy sort of screams to be integrated back into our world. I do like Velvet Underground, especially with Nico. But my first love was always The Doors. I would always choose Nature over culture! It’s a double Pisces whammy, the Velvet Underground — balanced out by a double dose of Virgo for Mo and Sterling. The difference between J and P in the MBTI is seen most overtly as a question of planning. If you have 5 things to do, do you have a plan of attack (J)? Or do you just attack (P)? wow, I love John Cale, and actually had never looked up his birthday before. 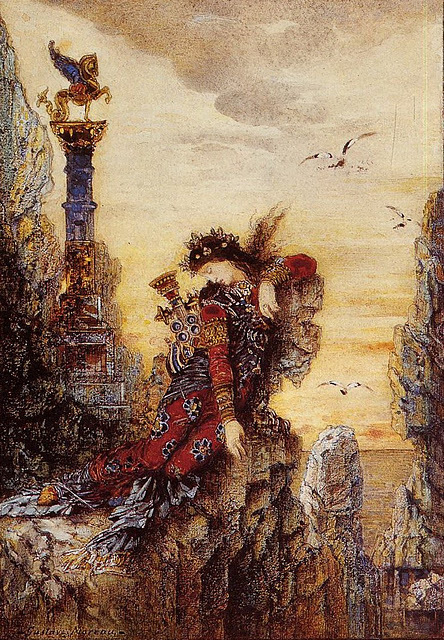 Cale and Reed did connect in the realm of Pisces. I also never realized Sterling and Mo were both Virgo. I did know Lou Reed was a Pisces, who I see as one of the celebrity rock star persona archetypes of Pisces, like Kurt Cobain later. I guess I can look no further than my birth chart for my VU connection! I am poised between planning and attacking. Interesting. 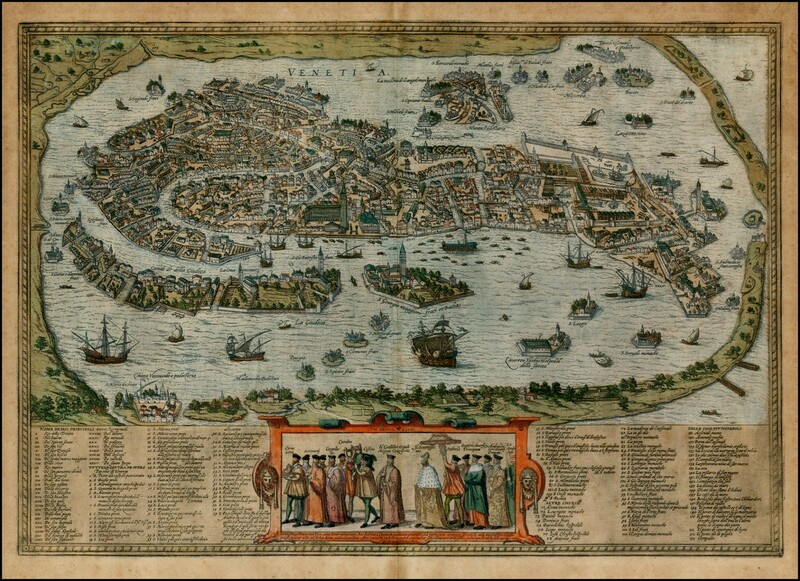 If you were dropped in a foreign location with supplies but no map — Would that be fun or an utter pain? Ok, ok, I am more J than P. It would be a pain. Wow. Very illuminating about darkness! She achieves tranquility, and then some dumb man messes it all up. And again…. and again… 😉 I was really impressed with your articulation of her civilizing function of man/beast. The end of every romantic relationship for me occurs when I begin looking at the man as an incompetent and wondering to myself: “Why am I not being paid for all this toil? Why must I do my job *and* his?” I resent it immensely. I thought you might find Erzulie Dantor interesting in this context, especially given her associated saint image. This is a great link! Thank you, it confirms my intuitions. Oh I like the bit on Lilith. Have read only very little about her myself but always interested to find out more about her. Thanks, she is fascinating, I agree. That is fascinating, you have a great gift. I just felt powerfully drawn to her but hearing that she is the manifestation of the Black Tara is truly illuminating. Thank you very much for sharing your experience. Its great to share with people of similar interests! masterly analysis and expose of myths which only Monika’s pen could have achieved – the depth of knowledge, the deep and abiding interest in a subject so esoteric – but it is myths that make us – the Ramayana and the Mahabharata have shaped India given everyone his/her name, every brook every hamlet town and region its identity – though only a myth – as too one day The Lord of the Rings, Star Wars and Suprman etc will or has give/given America its identity. – the dark goddesses are alike in most cultures – fearful yet compassionate, terminating and reviving, ending and recycling. Thanks for your beautifully expressed research. alas i have only heard of it – in india everyone is perpetually and sometimes partly consciously playing the parts of that great epic (except of course the avatar krishna) every day every moment as if the archetypes have now possessed us all – and of course everyone has names from the mahabharat and ramayan. Is your name also of this origin? which of course i have not! Very interesting 🙂 I love etymology. i looked up that word which i didn’t know – origin of words – ya it is interesting and the foundation of our psyche – whats in a name – be careful what you name your son! – it may influence him in ways you will never know. Yes! This was a wonderful post!! Much needed thank you!! !